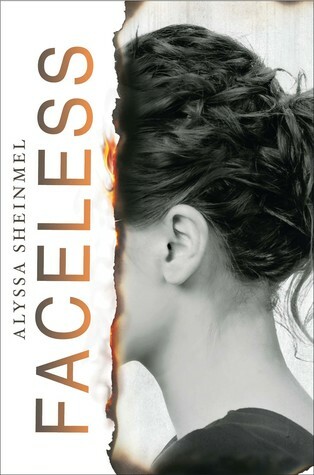 Faceless by Alyssa Sheinmel. Grades 7 & up. Scholastic, 2015. 345 pages. Review copy provided by publisher. What if you looked in the mirror and saw someone you didn't recognize? When Maisie wakes up, she's in the hospital. Her memory is fuzzy, but she slowly learns the truth: she was running and it started storming. Lightning hit electrical wires which hit her and she was burned. She has second-degree burns all down her left arm and side. But worse than that, her face was burned. Her face was burned off. And she gets a face transplant. Everyone keeps telling Maisie that she's lucky. She's lucky that a donor came up just when she needed it. She's lucky that the fire didn't take her eyes or her mouth. But Maisie doesn't feel lucky. Now, she's kept on a strict regimen of intense medications to ensure that her body doesn't reject the new tissue. Her boyfriend Chirag remains steadfastly by her side, but he can't bring himself to touch her. What if you had to go to school wearing someone else's face? I picked up this book because the plot sounded absolutely fascinating and it did not let me down. I'm always a little wary with books like this that could easily veer into sensationalism, but what I found here was a well-grounded contemporary story about a girl piecing her life back together after a traumatic event. It's fascinating to me (and, I think, to teen readers) to put myself in Maisie's shoes. How would I deal with this if it happened to me? Alyssa Sheinmel has that angsty teen voice down in a way that is realistic and recognizable without being annoying. Maisie's actions and decisions were realistic in a way that made me sympathize and root for her, even when I could see that she was making mistakes. I especially liked Maisie's relationships with people in her life and how they evolved after her injury and as she started to accept what had happened to her. Her boyfriend Chirag is trying to "be a good guy" and stand by her, even though Maisie is a different person now (both physically and mentally). Her best friend Serena actually does remain steadfastly loyal, even when Maisie is not able to give much back to their friendship. As Maisie comes to grips with what happened to her, these relationships change in ways that are both interesting and believable. I would hand this book to middle schoolers and high schoolers who enjoy reading stories about teens dealing with something bad happening to them. The Running Dream by Wendelin Van Draanen and/or A Time to Dance by Padma Venkatraman would both make good readalikes for kids who enjoy reading about teens dealing with traumatic physical events (leg amputation in both those books). Teens who are fascinated by the concept of dealing with facial injury might enjoy Lucy Grealy's memoir Autobiography of a Face, published for adults in 1994.